Today I’m sharing a favorite recipe of mine. I’m kind of proud of myself, because this one is 100% my creation. I’m sure others have done this before me, but I haven’t ever seen this exact recipe. The very first blog I ever read was Kevin and Amanda. It was right after we were married in 2010 and I was always scouring the internet for recipes. That blog popped up, and it started my journey into reading blogs every day. I’m addicted to a lot of food blogs and DIY blogs. Maybe in a future post I’ll talk about my favorites, but for now I’ll just say that there are some awesome bloggers out there who are incredibly talented. 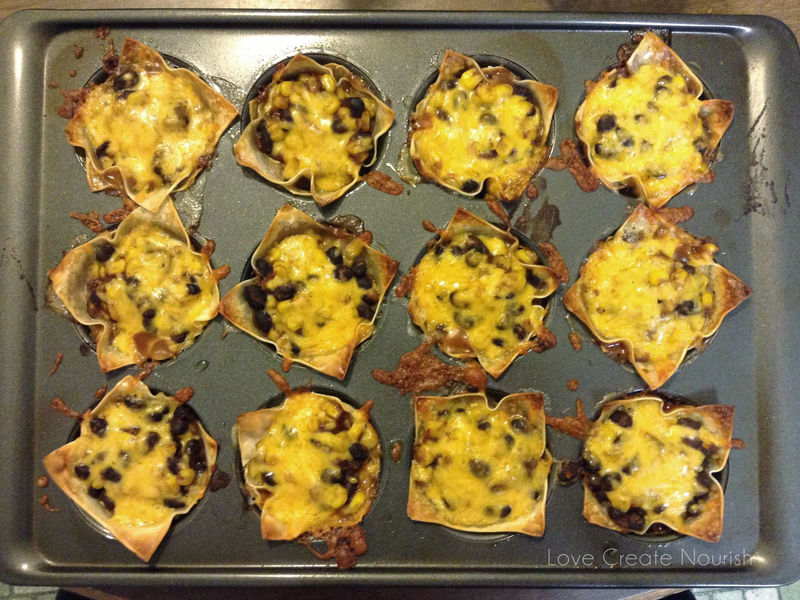 A little while after I started reading Amanda’s blog, she posted this recipe for Lasagna Cups. I think I made them the next week. They were a hit! The hubs and I both love them. There’s something about the wonton wrappers . . . they bake up crispy and golden brown on the edges, soft in the middle . . . they’re just really, really good. So that recipe got me thinking: what else can I put in these wonton wrappers? The possibilities are endless! Pretty much my first thought was something Mexican. I grew up in a Mexican-food-loving family and was pretty spoiled to have authentic Mexican restaurants minutes from my house. Even now, I probably make one or two Mexican dishes a week. 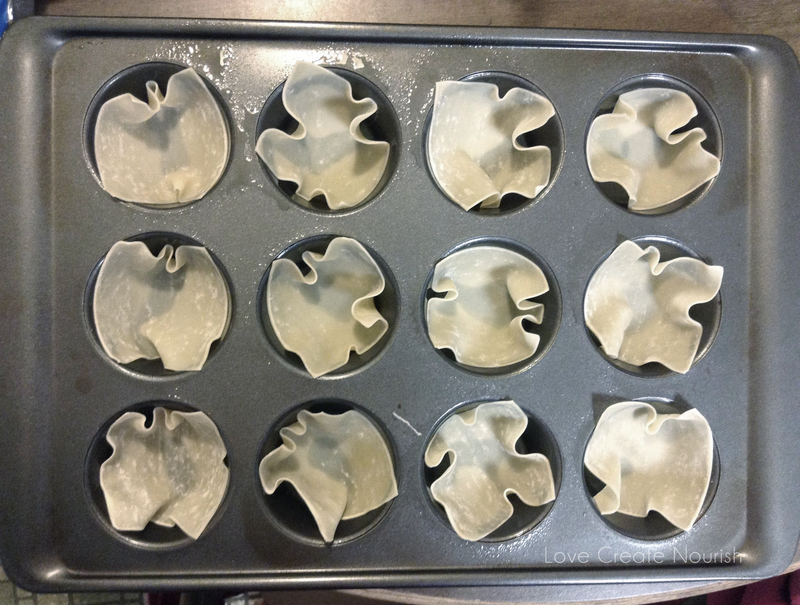 I knew I could whip up something delicious with those wonton wrappers in a muffin tin, and keep it relatively cheap by going meatless! If you’ve never done this before, you have to try it! You just place the wrappers in a sprayed muffin tin and layer from there! These would be fabulous as a party appetizer if you just did one layer. When I make these for a dinner, I always do two layers like the original Lasagna Cup recipe. Mmm, mmm. They are so good with a little sour cream on top. These are incredibly easy to make and only use seven ingredients! *Side note on the photography: Yes, I would love to take amazing pictures like so many food bloggers do. But in this season of life, I work during the day and am typically making dinner anywhere from 6:15-7:30 pm. Up here in New England, it’s dark by then. So maybe someday I’ll have naturally-lit, beautiful photos. For now, I’m choosing not to be hindered by the light and I’m sharing what I love! Combine beans, corn, salsa, and seasonings in small saucepan over medium heat. Stir well and heat through. Spray a 12-tin muffin pan. Place one wonton wrapper in each cup. Place one large spoonful of the bean mixture in each cup. Top with a bit of cheese. Place another wrapper on top; layer bean mixture and cheese again. Bake at 350 degrees for 11-15 minutes until edges are golden brown and cheese is melted.